The weather was supposed to be very challenging today. The Twin Cities was under a Winter Storm Warning due to anticipated heavy snow, sleet, freezing rain and high winds. As the morning went on, the storm shifted farther to the north. The Warning was then downgraded to an Advisory. As of this writing, it is raining hard. There is still a chance of freezing rain tonight and a chance of a couple of inches of snow tomorrow. The day had an unexpected turn of events, but it was in our favor. Lucy’s day had an unexpected turn of events, but in her favor. Marynne from Minnesota Oncology visited with her this morning because Dr. Thurmes was unavailable. Lucy’s leg is improving very slowly. Dr. Nashawaty feels that since Lucy had not had a nosebleed in several days, perhaps the TPA catheter option is available. Her next visitor was Dr. Dittes, an Infectious Disease specialist. He felt that Lucy may have cellulitis but acknowledged to her that her blood cultures and blood tests show no obvious indication of a bacterial infection. He also told her that her blood clots could be the majority of the fever spikes and redness. He changed the antibiotic she was on to two different IV antibiotics. There is no cause for concern. Marynne came back a bit later. She was going to see if Interventional Radiology wanted to do the TPA procedure. The best guess was that Lucy would have it done tomorrow morning. They had time today and got to her about 1:30 this afternoon. The procedure went very quickly. They completed it by 2:45. There was a very large clot in her thigh. The clot in her calf was small enough that they were going to let nature take its course. Her left leg was less clogged than her right leg was a couple of weeks ago. We hope that means she will not need subsequent procedures and her recovery time will be shorter. It will be a couple of days before she will be able to do the Hokey Pokey. Of course having the procedure means she also moved from 8th floor to 3rd floor. The first move was into a two bed room. She moved again about 20 minutes later to a private room. Her evening is winding down now that there isn’t as much activity. She knows sleeping will be tough tonight because they have to wake her every two hours to do a neurology check. Lucy talked to Diane and Julie on the phone tonight and that helped brighten her day. 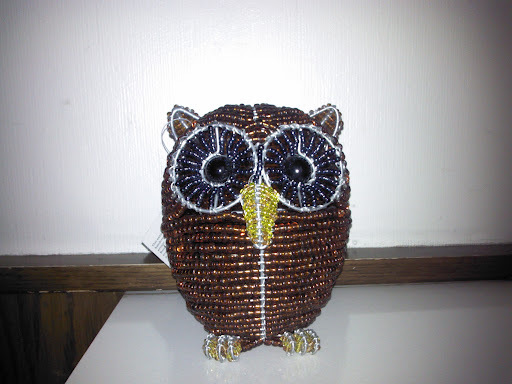 I found the beaded owl pictured below in the gift shop. It is beaded and stands about 6″ tall. Here’s hoping Leap Day goes well for her. We wish all of you a good evening and have a Happy Leap Day tomorrow!